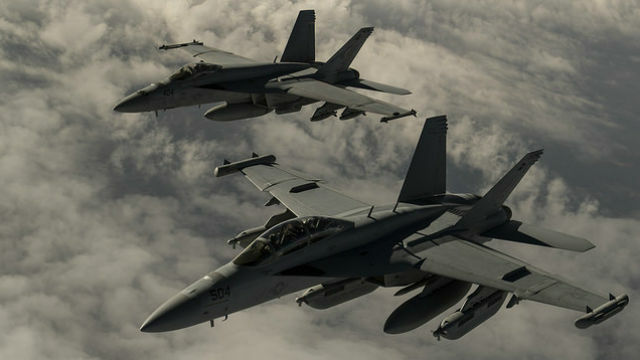 The American-led war on ISIS terrorists continued on Easter Sunday with U.S. and coalition air forces carrying out 21 airstrikes in Syria and Iraq. For nearly two years, the territory under control of the Islamic State of Iraq and the Levant has been hit daily, with aircraft targeting ISIS leaders, military forces and economic resources. Near Manbij, a strike struck an ISIS tactical unit. Near Mar’a, a strike destroyed six ISIS fighting positions. Near Baghdadi, three strikes struck an ISIS staging facility. Near Hit, a strike struck an ISIS tactical unit. Near Kisik, two strikes struck an ISIS tactical unit and suppressed an ISIS mortar position. Near Mosul, four strikes struck two separate ISIS tactical units, suppressed an ISIS mortar position and two ISIS tactical units, and destroyed an ISIS heavy machine gun position, an ISIS anti-air artillery piece and two ISIS fighting positions. Near Qayyarah, three strikes struck a large ISIS tactical unit and an ISIS security headquarters and suppressed an ISIS mortar position. Near Sinjar, two strikes suppressed an ISIS rocket firing position and an ISIS mortar position. Near Sultan Abdallah, four strikes struck three separate ISIS tactical units, destroyed three ISIS assembly areas and suppressed two ISIS mortar positions, an ISILS surface-to-air firing position, and an ISILS tactical unit. Under the Defense Department definition, a strike can range from one aircraft delivering a single weapon against a lone target, to multiple aircraft delivering dozens of weapons against buildings, vehicles and weapon systems in a compound. Coalition nations involved include the United States, Australia, Belgium, Canada, Denmark, France, Jordan, the Netherlands, the United Kingdom, Bahrain, Saudi Arabia, Turkey and the United Arab Emirates.